•	Located in the highly upgraded phase 2, Cortez building, 5th floor, unit # I-505, just perfect & over 1300 sq. ft. including the patio. Owner reserves the right to condo restrictions and total rental nights based on demand, so the 2 night minimum may not always apply. •	2 additional sleeping areas; one is a comfortable reading chair by day & a twin bed by night. The other is a top-of-the-line Lazy boy sleeper sofa with a queen size memory foam mattress for ultimate comfort. Take advantage of the folding privacy wall in the front closet for either sleeping area. •	If this one doesn't work for you, we also offer a 5th floor 3 bedroom condo VBRO 185522 (just 2 doors down) and a GROUND floor 2 bedroom condo VRBO 234928. All in phase 2 (take your pick from our selection of a 1, 2, or 3 bedroom condo). Have a large group? Give us a call. All three can sleep a total of 21. Owner reserves the right to condo restrictions and total rental nights based on demand, so the 2 night minimum may not always apply. •	Situated in the Sandy Beach resort area of Puerto Peñasco (Rocky Point), Sonora, Mexico, Las Palomas Beach & Golf Resort is a vacation destination set against the Sea of Cortez, a 3 ½ to 4 hour drive (212 miles) from Phoenix and Tucson, Arizona, and 677 miles from San Diego, California. This resort is the first one in Rocky Point to obtain the AAA 4 diamond status and only 3% of the 32,000 AAA qualified hotels enjoy this rating. 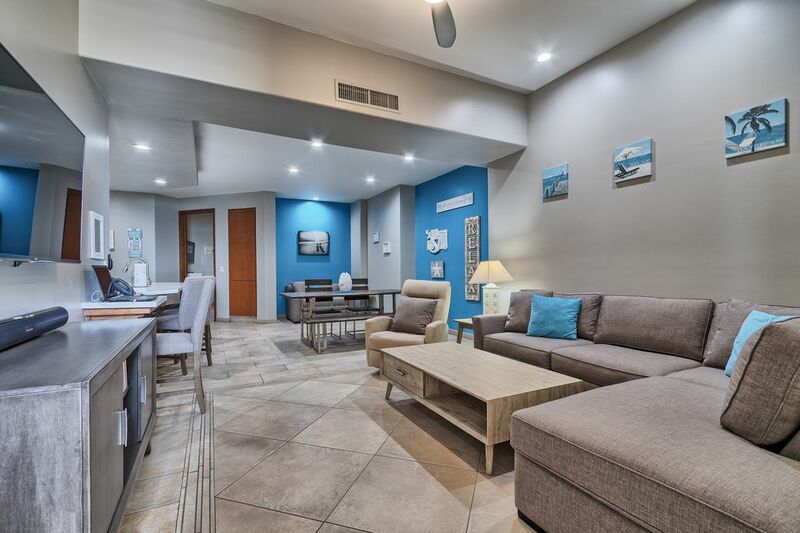 •	Las Palomas is the largest master planned resort community in all of Puerto Peñasco, which means it offers more amenities to you than at other resorts. It offers Palapas on the Beach, Beach Volleyball, Water Slides & Kiddy Pools, Negative-Edge Pools, Jacuzzi's, Swim-Up Bars, Lazy Rivers, High-End Lounge Chairs with optional Face Shields, Pool-Side Eateries, Upscale Restaurants, Sports Bar, Fitness Center, Onsite Spa, Convention Halls, and MUCH, MUCH, more...All within the secured grounds of Las Palomas which is gated and guarded by security 24/7! Restaurants include: La Maria Bistro, Citron, & Pool-Side Eateries. •	Las Palomas is a Seaside Golf Community, so BRING YOUR CLUBS. On-site 18-hole Jack Nicklaus-designed golf course. Our condos include a Resident Golf Membership, which allow our guests to pre-book tee times 30 days in advance and receive a discounted rate off the regular rates. Club rental is also available. Current rates with our membership, $35 for 18 holes and this includes the cart. If you are interested in booking, we will send you a detailed E-mail addressing each and every concern you may have along with additional links for your convenience and clear directions for booking. WARNING, NEW RULES EFFECTIVE 1/1/2019: All rentals at Las Palomas MUST go through the official rental pool. Although each unit is individually owned, Las Palomas controls the rates. If another owner is stating that they will send your keys, book you as an owner, guest of owner, or offering rates less than we are quoting, you will be renting illegally. Security at the main gate and front desk has been instructed to deny entry. The unit you may be renting under the table will have restricted services which may include no phone, cable, maid service, no pool and common area access, and other features you would expect. You can also be assured that the quality of the illegal unit, it’s furnishings, accessories, bedding, electronics, etc. will not have met Las Palomas minimum standards for the resort approved and managed rental pool. It’s supposed to be a vacation, not a nightmare. Only rent through a legitimate owner that is following the rules. As a 9 year representative of the Las Palomas HOA and Tourist Committee, I worked side by side with resort management on all hotel operations. We lead by example and our 3 condos are absolutely in top condition. We treat this as a business and personally visit our units at least 1 time per month. During those trips we maintenance our own properties and make improvements on each and every visit. We offer many high end custom features that most units do not offer and continue to receive extremely positive feedback from every guest about the details and over the top amenities that we offer. Our units were all updated in 2018 with fresh paint throughout, new bedding, new furniture, new kitchen accessories, new electronics, and overall as of 3/28/19 out of 343 total reviews for our 3 LP condos, 315 (92%) rated us as 5-star and 24 as 4-star. This 1 bedroom has 41 straight 5-star reviews. This is near record territory for pleasing the public overall. You will be sorry if you rent anywhere else. We have been vacationing in Puerto Peñasco (Rocky Point) for many years. We have stayed in most of the resorts in the area. We fell in love with Las Palomas & all of the amenities they offer. There is really no need to ever leave the resort! 24 hour security, ATM just outside the gates, on-site 18-hole Jack Nicklaus-designed golf course, (our units also offer a full resident golf membership that allows our guest/renters discounted rates and preferred tee times), daily maid services, plasma TV's, DVD players, Harmon Kardon sound system, laptop computer (yes, it’s included in your unit) Wireless high speed internet, (bring your own laptop for use throughout the condo), custom electronic wall safe, upgraded appliances, upgraded pillow-top mattresses, highly upgraded decor & all the conveniences of home. Double sinks, large walk in tiled shower, stone counter tops, make up mirror, wall mounted hair dryer, extra hanging closet space separate from master closet, guest entrance from hallway or from master bedroom. What a view! You are on the 5th floor overlooking the ocean, the beach, and the resort. Stunning views that are not obstructed by any other resorts...You are Beachfront! Las Palomas is beach front resort. Stunning Ocean Views with no other resorts in front of you...You are Oceanfront! Wake up to the sounds and views of the ocean to take the stress away! Telephones include room-to-room & intra-resort calling. There is also a phone in the master for mobility while talking on the phone! Central air conditioning for maximum comfort during your stay! Top-of-the-Line King Size Pillow-Top Mattress. Fully loaded with all linens, sheets, towels, etc. for your convenience. May want to bring your own comfy pillow. Onsite fitness room just a 3-4 minute walk with Brand New $200,000 update, best gym in all of RP. Standard Coffee and Keurig, don't forget filters. We inventory every 30 days so our required resort list and additional items are always in stock. Cozy kitchen table plus 4 bar stools, invite some friends for dinner, seating for 8. 50' wall mounted TV in the family room with a Harmon Kardon system plus a 42' wall mounted TV in the master bedroom! Harmon Kardon amazing sound bar, sub woofer, and wi-fi for easy connection. Master and great room both have a DVD player. Growing with each renter, bring one, leave one. No game room at the resort, come on it's 2015. We keep a few on hand plus card decks. Bring youu own device for the Wi-fi system. We have begun a video library offering movies for everyone in the family or you bring your own. We do not offer video games, sorry hang out at the beach instead. You have direct access to your own Private Balcony that overlooks the ocean, the beach, and the magnificent resort. The Balcony includes upscale cushioned patio furniture with 2 chairs with ottomans and a table to enjoy tanning, relaxing, or sleeping under the stars! Las Palomas offers several pools, play pools, kiddy pools, water slides, & lazy rivers on the premises! The Living Room includes a Sofa-Sleeper which turns into a Queen-Size Bed for any additional guests with a VERY comfortable memory foam mattress. There is also an as additional chair with a twin sleeper (memory foam) that can easily sleep 1 more person if you are looking to maximize the condos sleeping arrangements. Complete Bedding is included for Sofa-Sleepers as well as extra pillows and blankets for more even more guests. We loved our stay! The condo was perfect! We would definitely return! Beautiful condo, everything was there and super clean and beautiful decor. The home was well designed. All the amenities you could ask for, along with a beautiful view of the ocean. We only stay at this resort, this was our first time renting this one. By far the best one we have ever stayed at. Beautiful décor, stocked with everything you would need to enjoy your vacation. We continue to get the same comments on our condos, the BEST we have stayed at at LP. We go over the top, don't settle for less. We have been to many of the units at Las Palomas Phase 2 over the year's and must say if one desires to walk away and say to themselves we wish we had a little longer then the owner did an exceptional job with providing an experience to be remembered . The unit what can I say shows in the detail of the full remodel from all the furnishings down to detain. If an owner puts money back into the unit trust me they will get that back in return 10 fold because the unit will sell itself. Thanks for leading the example for others to follow. Once again if you are looking for a stunning place to stay look no further. We have been staying at Las Palomas for years now and this was the nicest so far. We usually stay on the ground floor because we like the quick access but the elevator was surprisingly fast. The owner was extremely helpful and very prompt with everything. I would highly recommend staying here! We have heard hundreds of times our condos are the nicest many have stayed in not only in LP but all of Rocky Point. So glad the trip worked out and thanks for yet another 5 star review. Stay in our condo and receive FANTASTIC deals on 18 holes of golf with our FULL resident membership, currently only $35 for 18 holes and this includes the cart. This is the highest level available and offers preferred tee times and major discounts. Other available activities include: Quad Riding, 4X4 Trails, Sand Dunes, and numerous beach activities. Required wristbands, all resort amenities, and daily maid service are included. Pets are not permitted in rental units at Las Palomas. The maximum permitted regardless of age in a 1 BR-4, 2 BR-6, and 3 BR-8. The resort will currently allow up to 1 additional person at $30 per night for the 1 BR with owner approval. Check in time is 4pm and check out 11am with no exceptions.